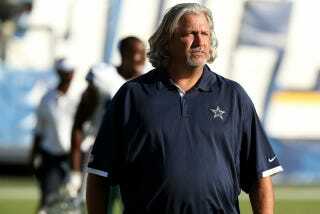 Jets head coach Rex Ryan and Cowboys defensive coordinator Rob Ryan are twins. Rex Ryan got lap-band surgery two years back, so Rob got it earlier this year. Rex has lost over 100 pounds. Rob's down 55 and counting. Sad news out of New York this morning; an era is over. Rex Ryan had lap-band surgery. "I can eat an entire pizza, easy," says Ryan, whose van is littered with pizza boxes the day he arrives at Valley Ranch after the drive from Cleveland. "Not in an eating contest. I can just do it. "I can eat anything, except that white one." Ryan is not a fan of pizza bianca. On the way to work one Monday morning, he finds an extra $70 in his pocket. He pulls over and decides to spend it all on candy. Chocolate. Peanut butter. Skittles. "An underappreciated candy right there," Ryan says. He throws the bounty in a bowl on his desk and it's gone before the week ends. And the story wouldn't be complete without a little Ryan-brothers-style lovin'. He tells his wife, Kristin: "I never had a salad until I married you."